Lieutenant Colonel Saw Doo, a Karen National Liberation Army veteran talked about his feelings and the effects of living and fighting during his 84-years had taken on his ‘weakening’ body. Lieutenant Colonel Saw Doo was a young, 23, but already a Platoon commander operating in Mone Township, in the Eastern Pegu region and told Karen News he read of the death of Saw Ba Oo Gyi in the newspapers. Karen Martyrs’ Day marks the death of the first Karen national leader, Saw Ba Oo Gyi, who was killed on August 12, 1950 by the Burma Army. The Karen Martyrs Day was ratified during Karen Government on April 1951 and since its inception it has been commemorated – this is the 61st year. Saw Maung Ae, a villager from Hti San in Hlaingbwe Township, provided the information that led Lieutenant Sein Lwin and his government soldiers to where Saw Ba Oo Gyi and his comrades where. Saw Ba Oo Gyi and his comrades – including General Sine Kay, Captain Lay Taw, Thara Waw Lay and eight other Karen fighters – were assassinated before dawn on August 12, 1950 in a farm hut in Toh Kaw Ko village in Karen state. Saw Ba Oo Gyi was born in 1905 in Begayek village in P’ Thein (Bassein) district of the Irrawaddy Delta. His father, Saw Tha Myat Gyi was a landlord and this allowed Saw Ba Oo Gyi to study at Nicole High School in P’Thein (Bassein) town. He then studied special English at Mr West Desmond School and was then accepted to study for his law degree in England. His cousin, Saw Pe Tha, was an ethnic Karen Member of Parliament, who was killed during the Japanese rule of Burma in 1942, when there was a Karen-Burman riot. Saw Ba Oo Gyi was active and a leading figure in Karen politics. The Karen started their revolution in 1949 and by 1950, Saw Ba Oo Gyi had introduced the four principles – that are still the backbone of the Karen Struggle today – during a KNU congress in Papun. Saw Ba Oo Gyi’s four principles are; 1. Surrender is out of question, 2. We shall retain our arms, 3. Karen State must be completed and 4. We shall decide our own political destiny. No ruling Burma government has ever recognized Karen Martyrs’ Day. Only the Karen armed resistance groups and Karen people do. In every Karen revolution area, Martyrs’ Day has been commemorated every year with the rising of the Karen flag, a salute to martyrs, praying by each respective religious sects, singing to honor the fallen and presenting wreaths. In 60-years of revolution, there have been many setbacks and the sacrificed of many lives. The military strength of the Karen revolution may have been weakened, but the morale and spirit of Karen resistance fighters has never weakened. This year, the 61st commemoration gave cause for celebration. For the first time in over 16 years there was signs of unification among the Karen armed groups. The Democratic Karen Buddhist Army factions who had recently rejected the Burma army’s attempts to make them part of a Border Guard Force took part. Sergeant Saw Doh Say, a member of the breakaway Border Guard Force, who had now reformed under their former DKBA flag, said it was his first time. Sergeant Doh Say explained that after the DKBA broke away from the KNU in 1994, he had never heard of Karen Martyrs’ Day. They said the Burma Army only allowed them to celebrate Karen New Year or DKBA Day. During the 60 years of the Karen revolution, there have been seven KNU presidents – Saw San Po Thin, Saw Hunter Tha Mway, Saw Ba Oo Gyi, Mahn Ba Zan, General Saw Bo Mya, Saw Ba Thein Sein and the current president General Saw Tamla Baw. In that time the Burma military dictatorship has also undergone a number of name changes. These include the Burmese Socialist Program Party, State Law and Order Restoration Council, State Peace and Development Council and the current Union Solidarity and Development Party government. None of these military regimes had recognized the rights of ethnic nationalities. 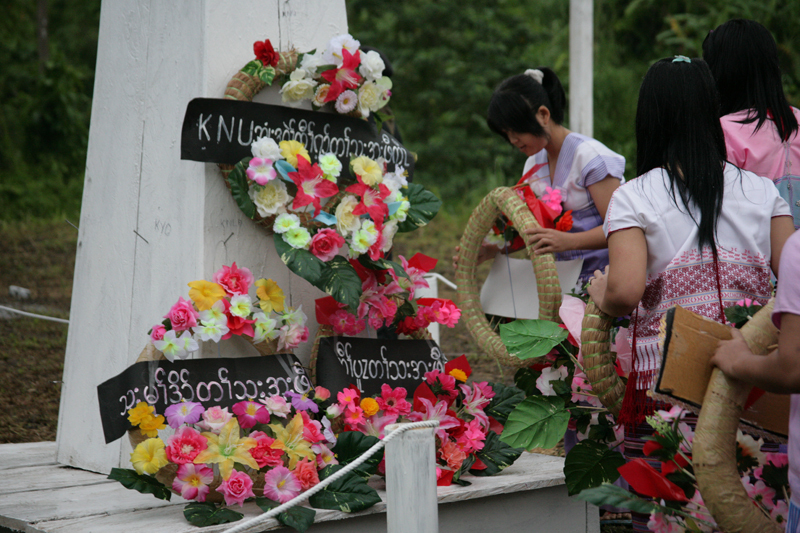 In spite of attempts by the various military regimes ruling Burma to outlawed Karen national days, such as Martyr Day, many Karen communities overseas tried preserve their nationality and history by celebrating Karen New Year, Karen Wrist Tying and Karen Martyrs’ Day in any country they are living in. At this year Martyr Day ceremony, KNU president Saw Tamla Baw, stated in a letter read out to the crowd that the Karen have been struggling to be free from oppression of the military regime but haven’t yet reached their victorious aim. Therefore, Karen people still need to continue their journey filled with blood and sweat as Saw Ba Oo Gyi and other martyrs’ did. Lt. Col. Saw Doo added his encouragement to today’s Karen revolutionists to continue to fight against the military government’s until they reach the Martyrs’ aim of victory. A young Karen working in education services said.